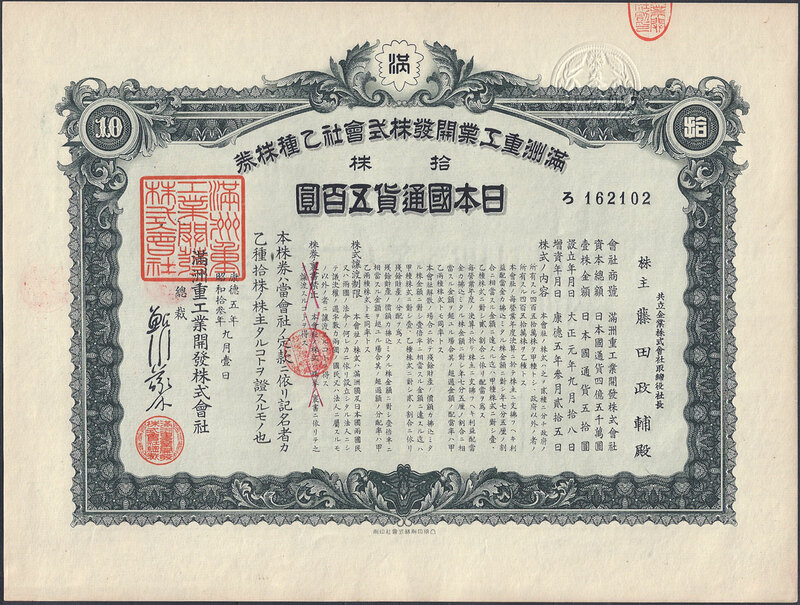 Manchukuo, like many other countries raised taxes on a variety of commodities. Many items were taxed before sale, such as cigarettes and could only then legally be sold if the item had a tax paid certificate affixed. Certain types of transaction were also taxed and proof of tax payment was normally a stamp like certificate. All of these stamps are rare and seldom seen at auction. Issued 1st May 1933. Cotton Gauze Control Tax Label (Cotton goods revenue). The stamp has no face value and is one of a set of 13, which levied a tax by value and by the weight of the goods. The stamps were engraved on un-watermarked white paper details of printers and designers are unknown. 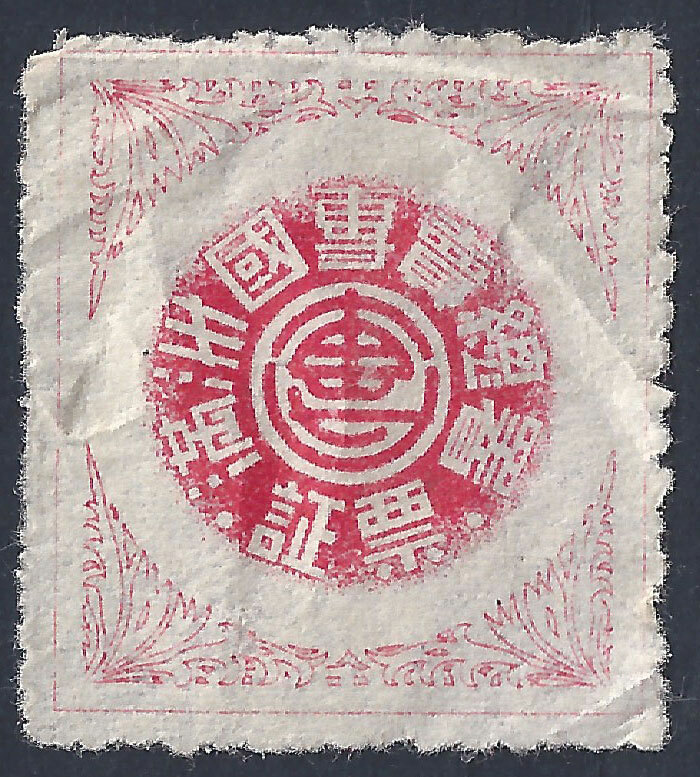 The stamp depicts Hsinking Palace. 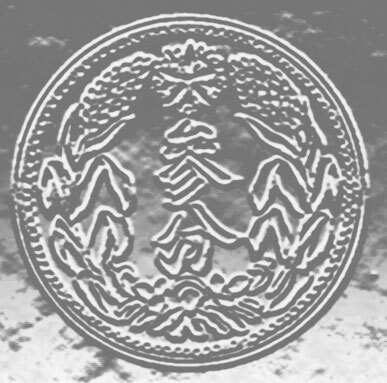 Similar designs exist for cement tax (8 values) and wheat flour tax (8 values). Issued c1934. This stamp has no face value and was issued to validate a receipt for export duty paid. 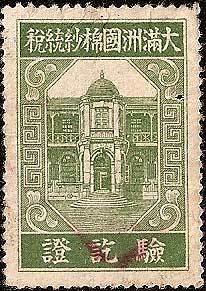 The design is very different from that of any other stamp issued by Manchukuo. The name Manchukuo appears in the circular panels in each corner. The central panel reads 滿州帝國 Empire of Manchuria, 輸出國 Export Country, 課稅 Taxed, 品 Item (product). Issue date unknown. The function of this stamp is unclear but it is probably designed to show that tax has been paid on a Monopoly Corporation controlled item, opium springs to mind. The characters read 満洲國専賣總署 - 証票 Manchukuo Monopoly Bureau -˙Certificate The central design is a stylized representation of the character 専 the logo of the Monopoly Corporation. The stamps are Litho printed on thin un-watermarked white paper details of printers and designers are unknown. There are five known versions of this stamp, a similar design but smaller 18.5mm x 22.5mm in brown and yellow. Also stamps consisting of the central design with lettering and logo, but without boarder, contained within a solid outer ring. These measure 12mm dia or 23mm dia. None carry a value. Introduced 1st January 1937. 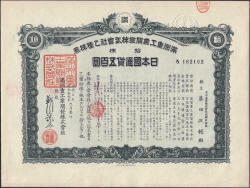 This tax was applied to financial transactions and sales of bonds and stock. Instead of a stamp, a record of the tax paid was indicated by an impressed seal. 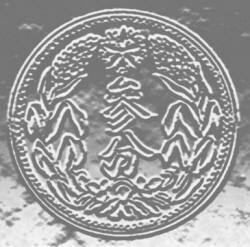 These seals are 30mm diameter and feature the emblem of Manchukuo the top with stalks of kaolin on either side, only the value is shown. 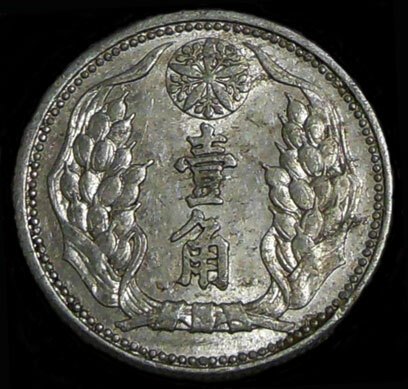 The design resembles coins in use at this time. The above example is 3 fen, the most common value for bonds. Click on the bond to enlarge the image, the seal is top right. 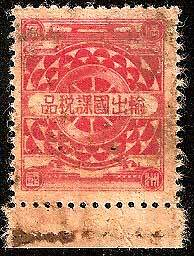 Stamp duty seal values known include 1 fen, 2 fen, 3 fen, 5 fen, 10 fen, 20 fen, 50 fen, 1 Yuan and 2 Yuan.